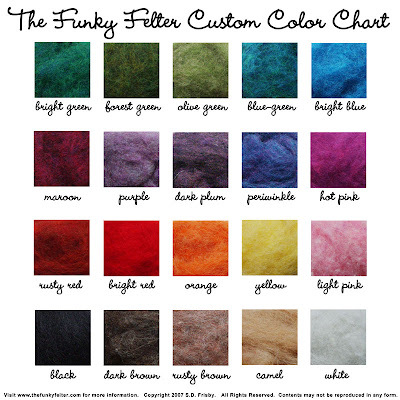 The Funky Felter: Okay, so have it your way . 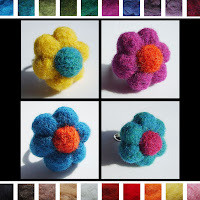 . . new custom color needle felted rings, pendants, and hair pins! Okay, so have it your way . 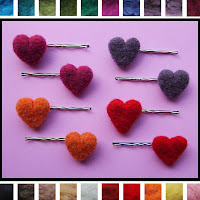 . . new custom color needle felted rings, pendants, and hair pins! Now you can have it your way . . . I'm offering some of my most popular designs of rings, pendants, and hair pins in 20 different customizable colors. You can pick your favorite color, or pick out a color for a friend, coworker, child, sister, mother, girlfriend, wife, etc., etc., etc. There are hearts, ladybugs, smiley faces, flowers, bubbles, and butterflies that can now be personalized with whatever colors that you choose. 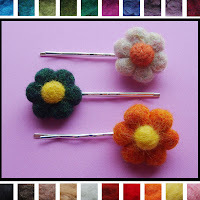 Each one is individually needle felted to your color request. There are 15 custom color listings available with a price range of only $10.00 - $15.00 so you can afford to buy a few for yourself and your friends too. You can also contact me via Etsy conversations or my website to request larger quantities. If you'd like to pass out the felted goodness for upcoming birthday gifts or favors, work parties, or holiday presents, contact me about a custom listing or bulk order just for you. Please check out the new "You Pick the Color" section of my Etsy shop for further details on these items. You may also check my Mintd shop for some custom color listings too.